College coaches work 75-85 hours per week and in most cases for a fraction of the pay they could make in other professions. So why do they do it? 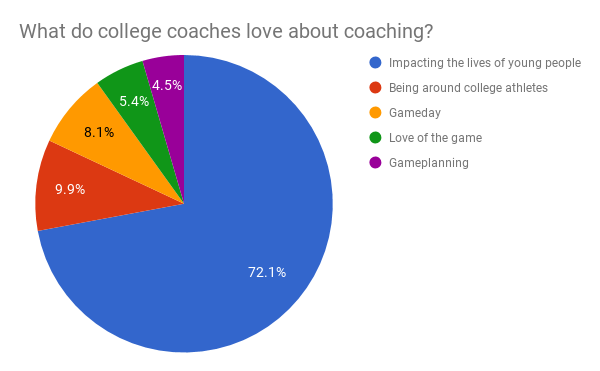 We surveyed coaches across all of college football to find out what they love about coaching. Overwhelmingly, coaches answered that “impacting the lives of young people” is what they love the most about their jobs. While most people, when they think of football coaches, picture them on the sideline during gameday, only 8% of coaches consider gameday as the favorite part of their job. Think about how you can increase the time you spend impacting the lives of your athletes and make your career even more fulfilling.